Love is in the air, and on the digital airwaves. At least that’s how Internet users feel. Fifteen percent of U.S. adults and seven million residents in the U.K. sought companionship — or love — online in 2016. More than forty-nine million (49,000,000) adults in the U.S. paid on average $243 per month for the privilege in 2016. As more and more people worldwide turn to their computers to find new relationships, online dating sites are booming. Many adults find that online dating reduces the awkwardness of meeting new people, and also offers convenience and anonymity. In 2014 the Better Business Bureau (BBB) received over 4,000 complaints about dating sites — billing and cancellation issues, too few matches, being victimized by scams, or catfishing by other members. That’s not improved. Even the FBI warns of online dating scams. So while many happy matches result, is it any wonder online dating merchants fall into the “high risk” merchant category? Suspicious merchant activity, like processing transactions on behalf of another business not authorized for the account. Excessive chargeback levels cause the majority of canceled merchant accounts. The major networks (Mastercard and Visa) usually require merchants to keep their chargeback ratio below 3%. But it’s probable online dating merchant termination will occur long before merchants experience a threshold breach. Can you see termination coming? If your business is hit with a revenue hold, consider that a sign of trouble brewing. 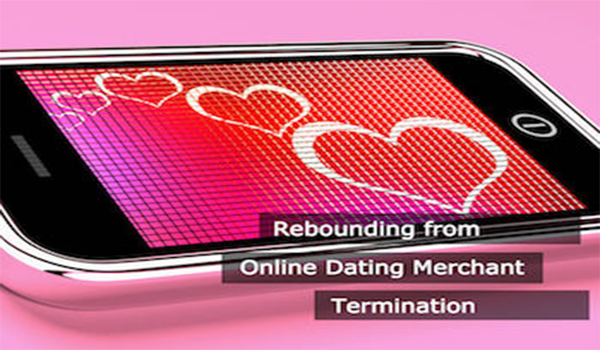 Online dating merchant termination could be next. Putting your business owner thinking cap on, it’s easy to understand why online dating merchants are considered high risk. Merchant accounts represent two lines of credit. One extends from the bankcard network (Visa or Mastercard) to the customer. The network makes a payment to the merchant’s bank on behalf of the customer. The second line of credit extends to the merchant from the acquiring bank, which deposits funds into the account before the customer pays. As always, there’s risk associated with lines of credit. The merchant could go out of business — chargebacks could exceed the account balance — or the merchant could engage in fraudulent activity. In addition to the line-of-credit risks, many online dating business models rely on free trials followed by recurring payments. Traditional banks don’t necessarily understand or value online businesses’ recurring payment models and they need to mitigate their risks… hence the high-risk label. There’s good news: All is not lost. Steps can be taken to find a new processing partner. Most important is to be realistic and don’t even think about hiding the facts of what happened, and why. Find out the real reason your account was terminated. Don’t assume that you know the answer. Get a written report, as it will be needed for a new account application. Confirm whether or not you were added to the MATCH list (Member Alert to Control High-Risk Merchants) as a result of online dating merchant termination. It’s not ideal, but if you’re on the list, don’t try to hide it when you apply for a new account. Gather at least six months worth of processing statements. Check that you have them before losing access to your former processor’s reporting system. Start Looking for a new acquirer, but don’t waste time contacting regular acquiring banks. Be realistic and go straight to a high-risk merchant account provider. Be honest and forthcoming. Always. That will work in your favor. Stay professional, and don’t be impatient. Relax. Don’t apply undue pressure if approval takes longer than you’d like. High-risk merchant processors deal with many regulations and regulatory bodies. It can take awhile… Let them do their job. Be compliant. Acquirers scrutinize all new merchant account activity, but even more so for merchants who’ve been terminated previously. Stay compliant with all aspects of your new agreement, and there should be nothing to worry about. Get professional help, especially with chargeback management processes. Seek assistance the second time around. Otherwise, you’ll be destined to repeat the same mistakes. The payments industry supports many types of payments processors. You’ll be able to find one providing services to result in a happily-ever-after processing relationship. The best way to find your match is to know what you really want in a partner. Is it a cost-effective merchant processing solution to support your projected volume growth? Do you plan to expand internationally? If so, you’ll need a reasonable monthly processing limit that can grow with you, and a fee structure you can live with: no up-front reserve requirement, no “bait and switch” behavior and no hidden fees. If promises are made, expect them to be kept. Ideally, you should also want a processing partner who will work with you to resolve fraud and chargeback issues should they arise — as they inevitably will — someone to help you avoid another online dating merchant termination. You’ll want to find someone who can work with you to assess different payment channels and help you choose the right payments processing path and partners to support your specific business needs. Finding the right payments processor is like finding a partner to alleviate the blues and share the load after a relationship gone bad.